GIMP is the GNU Image Manipulation Program. 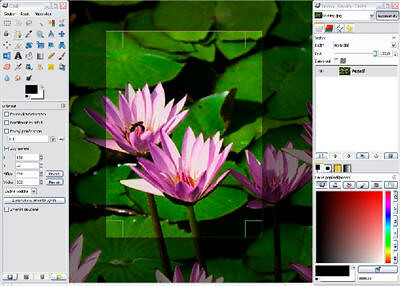 It is a freely distributed piece of software for such tasks as photo retouching, image composition and image authoring. It works on many operating systems, in many languages. It has many capabilities and can be used as a simple paint program, an expert quality photo retouching program, an online batch processing system, a mass production image renderer, an image format converter, etc. GIMP is designed to be augmented with plug-ins and extensions to do just about anything. The advanced scripting interface allows everything from the simplest task to the most complex image manipulation procedures to be easily scripted. The following online file storage services allow to save, browse and share files, photos, and documents from any computer or mobile device. Driveway enables to upload multiple files, upto a maximum limit of 500 MB per file. free account provides 2 GB storage. Users can manage and share file folders with ease, track file downloads. FileFactory lets you host files up to 300MB for free. You don’t have to register and there is nothing to download. Your files can be downloaded an unlimited number of times. MailBigFile requires no registration. You can send up to a 100MB file to one recipient. BleachBypass is a Photoshop-compatible plug-in designed to digitally simulate the traditional “bleach bypass” technique, producing pleasing film-like results. The bleach bypass, or “bleach skip” technique involves the partial or complete skipping of the bleaching stage during the processing of a colour film. This prevents the silver from being removed from the negative, and the result is a contrasty image with muted colours. The technique is often used extensively in motion pictures, such as “Saving Private Ryan” and “Three Kings”. Exploding Boy offers free CSS navigation menus that are created using the Sliding Doors technique. You may download the entire set and use any way you see fit. You may want to clean up the stylesheet, or alter the menu graphics to suit your needs. All the menus can be used for commercial or private use.